VANCOUVER, BRITISH COLUMBIA--(Marketwired - Nov. 28, 2017) - Monument Mining Limited (TSX VENTURE:MMY)(FRANKFURT:D7Q1) "Monument" or the "Company" is pleased to report significant results from its recently completed drilling program at the Peranggih Gold Prospect, located approximately 10 km North of the Selinsing Gold Mine (Figure 1). 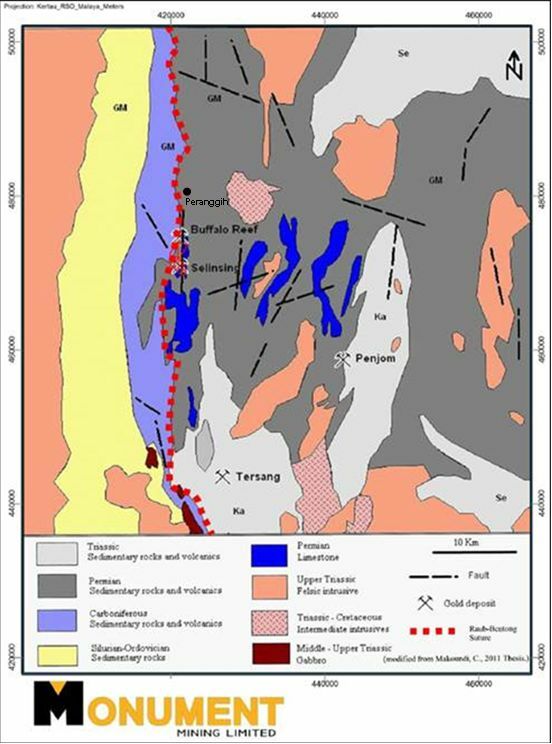 A close spaced 5m x 5m Rotary Air Blast (RAB) drilling program together with previous exploration has successfully delineated a zone of higher grade gold material, indicating that the mineralization occurs in the same regional shearing structure hosting Selinsing and Buffalo Reef deposits. The recent 2017 close spaced RAB drilling program was carried out at an historic mining site to test 150m strike length x 80m width of the mineralization. This allowed the accurate identification of several high grade gold (HG) zones surrounded by a main low grade (LG) halo. The significant drill intersections (Au >2.0 g/t & >5m length) within a more consistent high grade gold area are presented in Table 1.The full set of drill results for the holes intercepting this HG gold mineralization occurrence are listed in Appendix A and Appendix B. The Peranggih Prospect has been identified as a new Gold Field that has the potential to host a significant mineralized hydrothermal breccia system. The low and high grade gold mineralization is hosted in both matrix supported and clast supported quartz breccia. 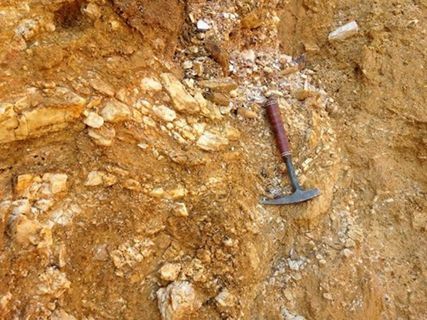 Significant coarse free gold was observed hosted in the breccia matrix. The matrix is friable and loose material composing clay minerals and small rock fragments, as well as mixed ore and/or gangue minerals (Figure 2). This leads to a nugget effect on the gold distribution throughout the deposit. The presence of well crystallized coarse free disseminated gold in the matrixes was not well recognized during the earlier exploration campaigns. This key finding had changed the perspective and approach facilitate better and more appropriate sampling and analysis methods to be applied to future exploration programs which include comparative work between traditional fire assay, screen fire assay as well as reconciliation of grade by way of bulk sampling. Peranggih was historically mined in the late 1980's and into the early 1990's by local artisanal miners. Gold was recovered by traditional sluicing and residual tailings and other evidence indicates substantial work was undertaken throughout this period. In 2014 the company conducted exploration drilling with encouraging results, followed by soil sampling, trenching and other reconnaissance mapping to understand the extent and boundaries of the system at Peranggih. The recent work determined that the gold mineralization is associated with a hydrothermal breccia system which is distinct from the hydrothermal veins system that occurs at Selinsing and Buffalo Reef, but still related to the same regional shearing structuring. Previous activities plus more recent exploration works, totaling 1,700m for 21 trenches, 2,900m of Diamond Drilling (DD) and Reverse Circulation (RC) drilling for 35 drill holes, and 2,800m of close spaced RAB drilling for approximately 300 drill holes (completed in 2017) have been used to outline an exploration target of 20,000 to 30,000 oz Au contained within 1 to 2 Mt @ 0.3 to 2.0 g/t Au. The potential tonnages and grades are conceptual in nature and are based on historical and recent drill and trench results that defined the approximate length, thickness, depth and grade of the portion of the internal resource estimate. There has been insufficient exploration to define a current resource, and the Company cautions that there is a risk that further exploration will not completely result in the delineation of a current mineral resource. Sampling, assaying and cyanide leach test work to date shows that recoveries exceed 80% ranging up to 98%. The system extends over a distance of approximately 1.2 kilometers in length with varying widths of between 25 to 50 meters with identified areas of high gold grade mineralization surrounded by a halo of lower grade mineralization. The system is open down dip and along strike. Further exploration work primarily aims to carry out resource definition drilling around an area selected for bulk sample testwork. Regional exploration should also identify other target areas within the same Peranggih oxide system, eventually adding oxide mill feed sources to the Company. The Company plans to mine a bulk sample of up to 50,000 tonnes, feed it to the existing Selinsing oxide gold processing plant to establish the average grade of the close spaced drilled area; and test the metallurgical performance at plant scale. This work can commence as soon as the access road has been prepared which is estimated to be in the beginning of 2018. Roger Stangler, Chief Managing Geologist of the Company, MEng, MAusIMM, MAIG, has prepared, reviewed, supervised the preparation and approved the scientific and technical disclosure in this news release as a Qualified Person under NI43-101 standards. Monument Mining Limited (TSX VENTURE:MMY)(FRANKFURT:D7Q1) is an established Canadian gold producer that owns and operates the Selinsing Gold Mine in Malaysia. Its experienced management team is committed to growth and is advancing several exploration and development projects including the Mengapur Polymetallic Project, in Pahang State of Malaysia, and the Murchison Gold Projects comprising Burnakura, Gabanintha and Tuckanarra in the Murchison area of Western Australia. The Company employs approximately 190 people in both regions and is committed to the highest standards of environmental management, social responsibility, and health and safety for its employees and neighboring communities. FOR FURTHER INFORMATION visit the company web site at www.monumentmining.com. This news release includes statements containing forward-looking information about Monument, its business and future plans ("forward-looking statements"). Forward-looking statements are statements that involve expectations, plans, objectives or future events that are not historical facts and include the Company's plans with respect to its mineral projects and the timing and results of proposed programs and events referred to in this news release. Generally, forward-looking information can be identified by the use of forward-looking terminology such as "plans", "expects" or "does not expect", "is expected", "budget", "scheduled", "estimates", "forecasts", "intends", "anticipates" or "does not anticipate", or "believes", or variations of such words and phrases or state that certain actions, events or results "may", "could", "would", "might" or "will be taken", "occur" or "be achieved". The forward-looking statements in this news release are subject to various risks, uncertainties and other factors that could cause actual results or achievements to differ materially from those expressed or implied by the forward-looking statements. These risks and certain other factors include, without limitation: risks related to general business, economic, competitive, geopolitical and social uncertainties; uncertainties regarding the results of current exploration activities; uncertainties in the progress and timing of development activities; foreign operations risks; other risks inherent in the mining industry and other risks described in the management discussion and analysis of the Company and the technical reports on the Company's projects, all of which are available under the profile of the Company on SEDAR at www.sedar.com. Material factors and assumptions used to develop forward-looking statements in this news release include: expectations regarding the estimated cash cost per ounce of gold production and the estimated cash flows which may be generated from the operations, general economic factors and other factors that may be beyond the control of Monument; assumptions and expectations regarding the results of exploration on the Company's projects; assumptions regarding the future price of gold of other minerals; the timing and amount of estimated future production; the expected timing and results of development and exploration activities; costs of future activities; capital and operating expenditures; success of exploration activities; mining or processing issues; exchange rates; and all of the factors and assumptions described in the management discussion and analysis of the Company and the technical reports on the Company's projects, all of which are available under the profile of the Company on SEDAR at www.sedar.com. Although the Company has attempted to identify important factors that could cause actual results to differ materially from those contained in forward-looking statements, there may be other factors that cause results not to be as anticipated, estimated or intended. There can be no assurance that such statements will prove to be accurate, as actual results and future events could differ materially from those anticipated in such statements. Accordingly, readers should not place undue reliance on forward-looking statements. The Company does not undertake to update any forward-looking statements, except in accordance with applicable securities laws.